In May 1977 my Father took me to a Celtic film show in a Church hall in the East End of Glasgow the name of which I can’t recall. The 1967 European Cup Final was shown in colour, its entirety, and it was a ticket affair such was its popularity. We travelled on the Uist Street Govan CSC bus which left from St. Constantine’s hall in Uist Street. Stevie Chalmers was there that night and talked through his winning goal in slow motion on the screen, frame by frame, as the audience, fortified by the local ‘wines and tonics’, roared on their approval as if they were actually in Lisbon on that night. In the old Glasgow parlance ; the place was rocking. This was the first time I had the privilege of watching the full ninety minutes from Celtic’s greatest day. My recollection is of being dumb struck by the performance of the Celtic number 4 on that big screen. 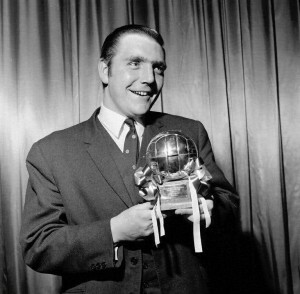 Bobby Murdoch gave a virtuoso performance, right foot, left foot, long pass, short pass and power shooting, Bobby had the lot and put it on display for the world to see that night in Lisbon. He was in short, magnificent. 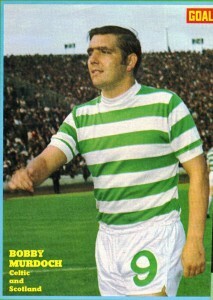 Jinky may have gave the Lions a certain dimension but Bobby was the Bhoy who made Celtic tick. 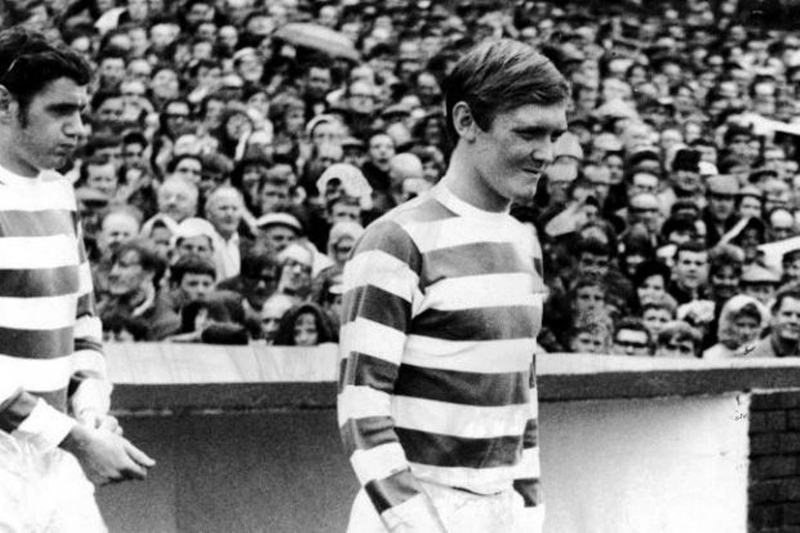 My Father used to ponder what would have happened to Bobby if Pat Crerand had stayed at Parkhead in 1963 and Bobby would perhaps have been lost. 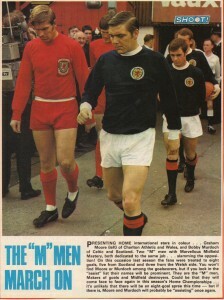 Thank goodness Crerand left because, frankly, he wasn’t in Murdoch’s league as a midfield player. 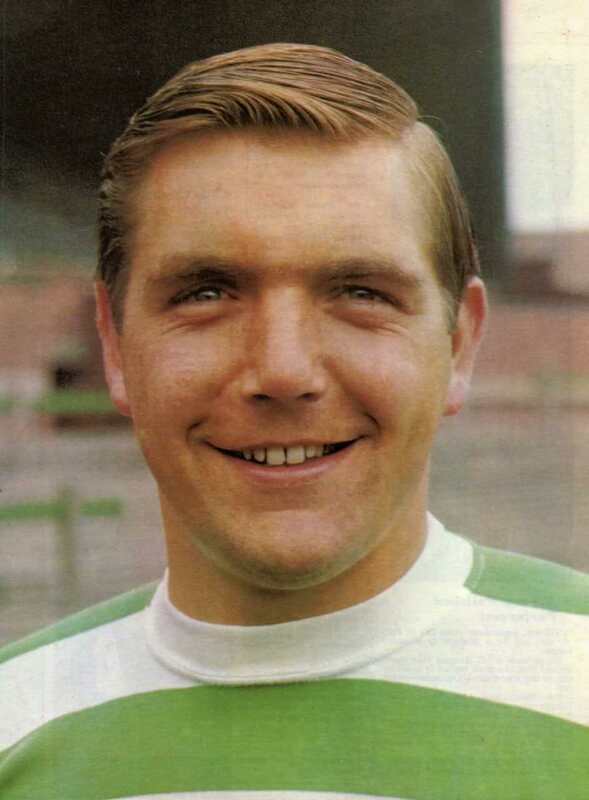 Bobby Murdoch followed in a long line of great Celtic right halves such as Young, Wilson, Evans and Crerand and would go on to be the best of them all. He had a subtle touch and yet varied this with powerful tackling and powerful shooting alike. 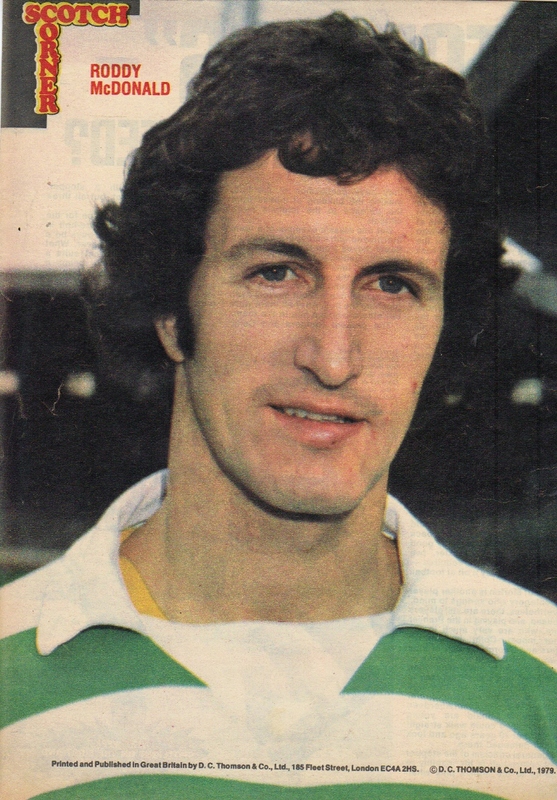 He excelled in the big Glasgow Derby games and scored thunderous efforts in 1966 (January 5-1 and August 2-0), January1968 and September 1970. He was perhaps at his best in Europe and reached his pinnacle in 1970 by destroying the much vaunted Leeds United in April 1970. 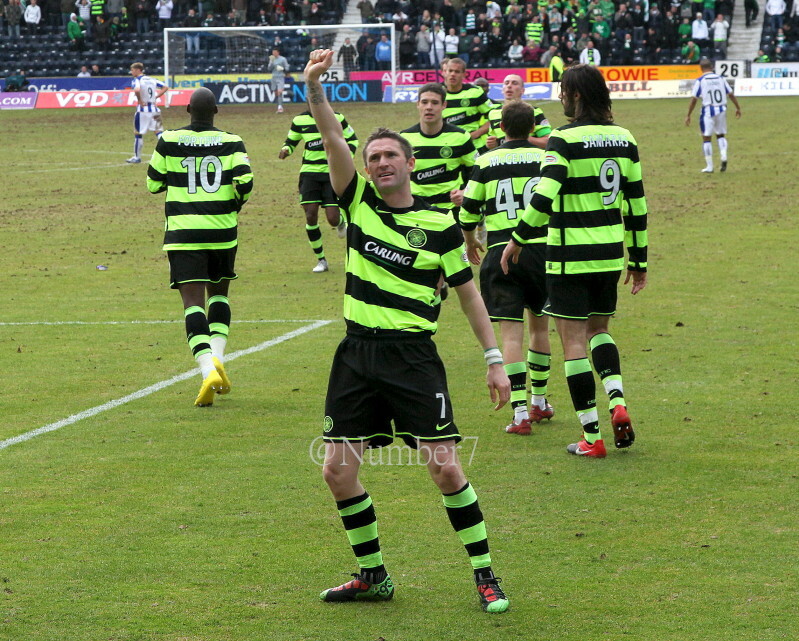 After scoring the winner at Hampden the memory still shows Bobby with arms outstretched saluting an amazing crowd of 136,000 in Hampden that night. 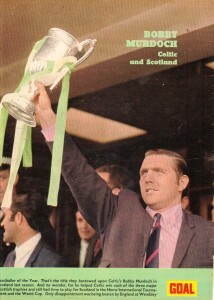 Many a European manager came to Parkhead and left impressed by Murdoch’s displays. The Fiorentina manager in 1970 described Bobby as the ‘Papa leading the Bambinos’. He was sometimes bothered by a weight problem and Celtic on occasions would send him to a health farm. He was badly missed on occasions and Celtic when Celtic lost to Ajax in the 1971 European Cup and to Hibs in the 1972 League Cup Final, it was Bobby’s influence that was missing. 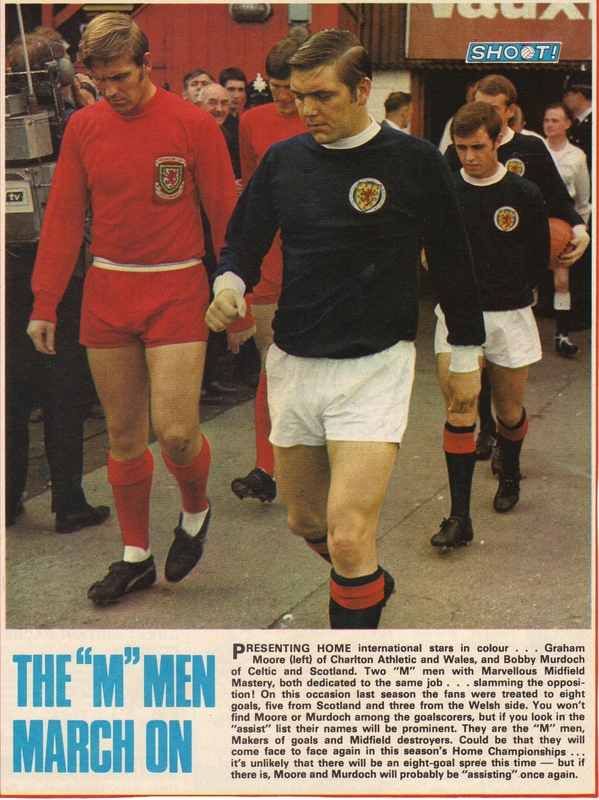 Stevie Murray had arrived in 1973 but it was still a shock when Bobby left for Middlesbrough. In later years Stein would bring Pat Stanton in as sweeper to help settle the Celtic defence and that is a role Murdoch would have loved and it would have suited him down to the ground. In 1992 I attended a Celtic ‘talk show’ with Bobby, Denis Connaghan, Tommy Gemmell and Stevie Chalmers. At this time the Celtic side were so inept that the crowd gathered enjoyed their night of nostalgia to help them forget the misery of the then current team. into it. He also stated that he had received sectarian abuse against several Scots teams but never, ever against Rangers and that to play for Celtic or Rangers in those days behaviour of the very highest standard was expected. What struck me was the modesty and humility Bobby showed that night. He spoke freely and with great respect for his fellow pro’s, both team mates and opponents alike. 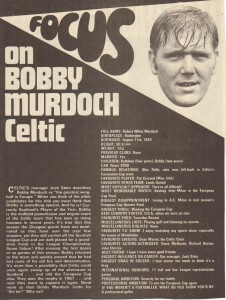 He seemed a thoroughly down to earth and likeable guy and it was clear that playing for Celtic meant more to Bobby than mere financial inducement. The phrase ‘jersey player’ suits him to a tee and few players gave more to Celtic in skill and effort than Bobby Murdoch. My Father was standing in a corridor later that night and out came Bobby. After an uncomfortable introduction my Father thanked him for the joy that he gave him in a Celtic jersey. Bobby looked a bit embarrassed and laughed, saying that he wanted to thank my Father and all the other Celtic fans for the incomparable support they had given Celtic through the years and stated that he was just a Celtic supporter fortunate enough to play for the Celts. In May 2001 I set out in the car for work on a sunny spring morning. 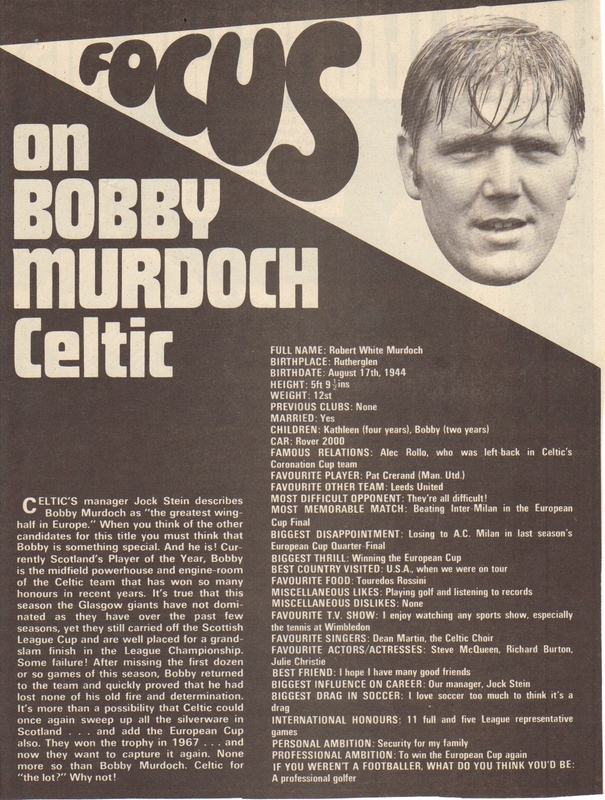 The news came on the radio that Bobby Murdoch had died. It is a moment I will always remember, sitting in the solitude of the car, a death in the Celtic family is felt by us all. Bobby, the youngest of the Lions, had departed and the team that always been regarded as invincible were mortal after all. The memory of Bobby Murdoch will last as long as Celtic exists; of that youthful smiling face, hair matted with sweat, lifting yet another trophy. To this day you will hear old guys around the stands at Parkhead shake their head in frustration in the displays of current Celtic midfielders. And they are right to do so as the bar has been set and it is a special player to come who will equal or surpass Bobby Murdoch’s achievements in the Celtic midfield. 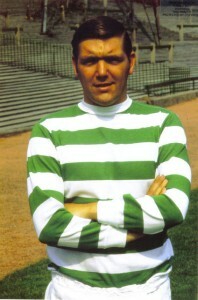 May Bobby Murdoch rest in peace.